Given its phenomenal setting on Puget Sound and a relatively short drive from the stunning North Cascades, Seattle is well known as a hub for adventure. From water-based sports such as sea kayaking, stand-up paddleboarding, and canoeing to mountain biking, hiking, and mountaineering, few major U.S. cities offer so many world-class opportunities for the adventurous soul to explore that are also so close to home. And yet, if you are a parent trying trying to structure a kid-friendly adventure, many of these stunning opportunities may be off the table for a while. Sea kayaking may be on the horizon, but a few years away; likewise, whether your child despises the carrier or is too big to carry, favorite hikes or climbs into the alpine may have to wait. Thankfully, Seattle has a host of great options for parents who clearly want to foster a love of the outdoors and get outside themselves while balancing these experiences with an array of practical concerns. Drive times, nap schedules, restrooms, weather, and emotional vicissitudes all weigh in. As a growing body of evidence has made abundantly clear, getting kids out in nature is imperative, and the lessons start with simple steps: wandering off trail to crunch into a pile of leaves, leaping into a puddle, or closely observing the texture and movements of a caterpillar. For kids, meaningful outdoor experiences need not be logistically complicated, aesthetically stunning, or even particularly unique; put yourself in the mind of a new explorer and the scale and scope of your adventure is all encompassing. Simple adventures that are sustainable for a parent to plan and execute are far more likely to become a regular feature in a child's early years, and establishing early outdoor habits are the fist steps toward making those family sea kayaking trips into the San Juans or backpacking trips around Mount Rainier a reality. Juanita Beach Park, East Lake Washington. Photo by Tyson Gillard. Below is a short list of easy options for Seattle-area parents of early explorers. Of course, ages, seasons, and temperaments will mean more flexibility than any one list can accommodate, so be sure to search by region for additional adventures and filter according to difficulty levels. John MacDonald Nature Loop Trail: Located in Tolt-MacDonald Park, this is a short loop with great picnic options and nearby restroom and park ammenities. Arboretum Waterfront Trail: At just under 2 miles, this floating hike is sure to fascinate young ones. Green Lake Inner Loop Trail: An easy and scenic choice for bike rides or runs. There is a separate lane for bike traffic, so be sure to stay alert. Also near plenty of open green space for more unstructured ambling. South Canyon Trail Loop: A very short walk to Lake Washington that is perfect for short legs and curious minds. Also a good swimming spot on hot days. Alki Trail: Skateboards, in-line skates, scooters, bikes...anything goes along the Alki Trail. Congestion can become a factor here, especially if you are trying to keep a close eye on your child. Plenty of park and beach options along the trail. Mercer Slough Nature Park: The network of trails, boardwalks, and bridges in this park provides great access to Lake Washington's wetlands. Fay Bainbridge Park: A terrific beach for exploring the driftwood and searching for shells. Restrooms, a playground, and picnic facilities are on site. Carkeek Park: Definitely one of Seattle's best. Miles of trails for hiking and exploring, a beautiful beach, and a playground with the classic salmon slide. Gas Works Park: The iconic stop on Lake Union never fails to fire up a child's imagination. Rolling hills, winding paths, and park amenities such as picnic shelters and restrooms. Olympic Sculpture Park: A great environmental success story and a perfect stop to nurture a little imagination and creativity outside. Green Lake Park: Beaches, boats, waterfront picnics, and a host of family-friendly events throughout the summer. Alki Beach: This Seattle staple has its crowds, but it is also low-commitment play area for parents who want to plan only a few hours at the beach. Houghton Beach Park: Boat and paddleboard rentals, a pier for swimming and sunbathing, and the essential amenities: restrooms and a concession stand. This is a very popular park, so arrive early for the best selection of spots. 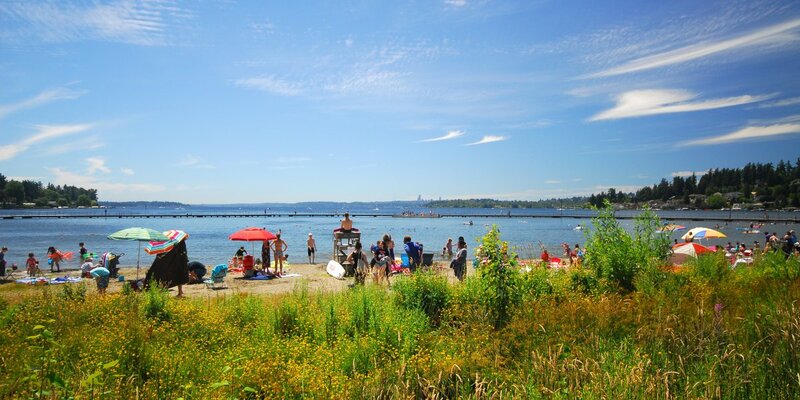 Juanita Beach Park: A large designated swimming area and a lifeguard tower make this a great choice for early swimmers. Golden Gardens Park: Worth the drive for the great views and large beach. Golden Gardens also has a large playground and plenty of picnic tables for a full day at the park. Lake Sammamish State Park: Just a short drive from Seattle, this park has beaches with designated swimming areas and restrooms with showers in addition to watercraft rentals and numerous picnic facilities.